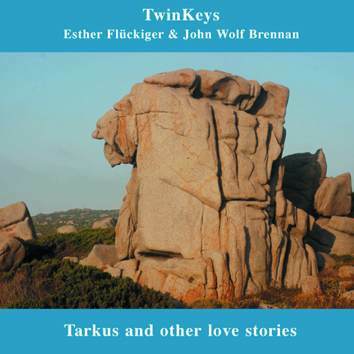 TwinKeys is a new project for two fine pianists, Esther Flückiger and John Wolf Brennan, but it's also a project that's deeply entwined with the special nature of the piano as a historical construct. The program presented contains 26 tracks in three large movements, each including arrangements of songs, original compositions or variations on themes, and improvisations. The melodic focus of the work derives from the songs, from "Larks' Tongues in Aspic," by King Crimson, "Tarkus" and "Jeremy Bender" by Keith Emerson, "Think of me with Kindness" by Gentle Giant and "I Know What I Like (in your Wardrobe)" by the members of Genesis. The very sound of the duo releases these songs from their time, placing it both within the history of the piano and its post-modern deconstructions.